Samuel Shatkin, D. D. S., M. D., of Amherst, a plastic surgeon whose career spanned more than 50 years, died Sunday, April 25th, 2010 after a brief illness. He was 79. The Buffalo native graduated in 1948 from Lafayette High School, where he was a track star and star guard on its football team. After graduating from the University of Buffalo in 1951, Dr. Shatkin went on to graduate from UB’s School of Dentistry in 1954 and from its Medical School in 1958. In addition to his work as a dentist, he was a respected plastic, maxillofacial and head and neck surgeon. During an oral surgery internship at Mount Sinai Hospital in New York City, Dr. Shatkin’s work with Dr. Arthur Barsky, its chief of plastic surgery, crystallized his goals to become a plastic surgeon. Following his graduation from UB Medical School, Dr. Shatkin completed four years of internship and residency in general surgery at UB-affiliated hospitals, including Buffalo General, Roswell Park and the Veterans Administration hospitals. After training in general surgery, he completed two years of plastic and maxillofacial surgery at Upstate Medical Center in Syracuse and entered private practice in 1964 in Buffalo with affiliations at Buffalo General, Children’s, St. Joseph, De- Graff, Columbus and Kenmore Mercy hospitals, as well as Erie County Medical Center. He also did volunteer plastic surgery at the VA Hospital for 25 years, saying he wanted to help the veterans who defended our country. Too young to serve in World War II, Dr. Shatkin contributed to the war effort by collecting scrap metal and was honored for collecting the largest tonnage in Buffalo in 1942. He served as president of the Buffalo Plastic Surgery Society, the Upstate Plastic Surgery Society and the American Society of Maxillofacial Surgeons. He also served as the chairman of the New York State Medical Society Section of Plastic and Maxillofacial Surgery. He also had served as clinical associate professor of surgery at UB Medical School since 1972. During his career, he trained many surgery and plastic surgery residents with his unique skills in the field of plastic and reconstructive surgery. In 1989, he established the Aesthetic Associates Centre for plastic surgery and dentistry in Amherst. 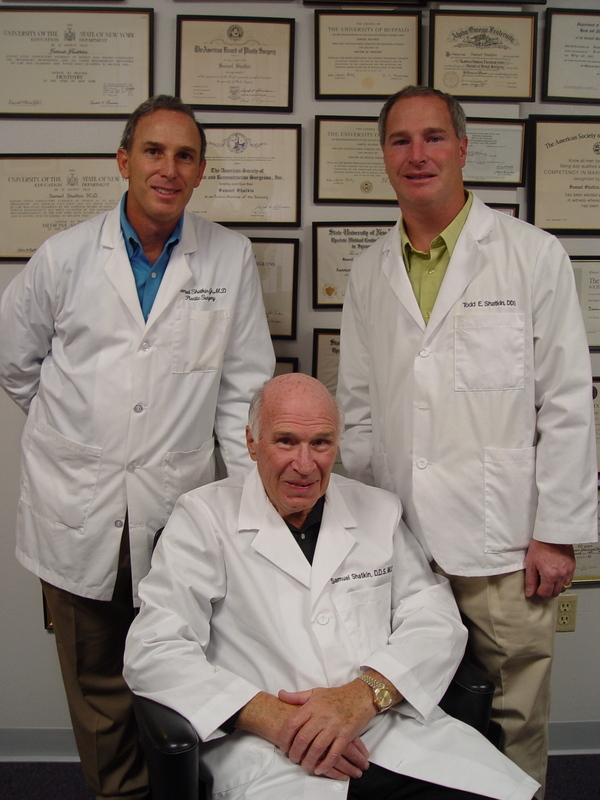 His sons, Samuel Shatkin Jr., M. D., and Todd Ellis Shatkin, D. D. S., joined him in the practice that same year and worked with him continuously until just a few months ago when he became ill. Among other specialties, Dr. Shatkin had a skin tumor practice and, with the American Cancer Society, offered free skin and oral cancer screenings. In the mid-1990s, Dr. Shatkin developed a rejuvenating skin care product line. In recent years, he devoted most of his practice to skin care. In addition to running his plastic surgery and dental practice with his sons, he and his son Todd developed new procedures in mini-dental implants and trained thousands of dentists worldwide on the techniques. Dr. Shatkin was a diplomat of the American Society of Plastic Surgeons, a fellow of the American College of Surgeons and a member and past president of the American Society of Maxillofacial Surgeons. Throughout his career, Dr. Shatkin presented hundreds of lectures and published numerous papers in his field. He contributed a chapter to John Siegel’s textbook “Surgery of the Aged Patient.” He also researched kidney transplantation, chest wall reconstruction and jaw reconstruction. In addition to his two sons, survivors include his wife of 58 years, the former Joan Ellis; and two daughters, Cynthia Oppenheimer and Darcy Wallen. Dr. Todd E. Shatkin is the director of dentistry at the Centre, and performs all aspects of General and Cosmetic Dentistry. He has been in private practice in dentistry since completing dental school at the University of Pacific. Dr. Todd E. Shatkin provides all types of cosmetic and implant dentistry, including the newest "mini dental implants", which can be immediately "loaded" with dentures or prosthesis, to offer an immediate solution to poorly fitting dentures or one or more missing teeth. He has been in the forefront of new dental procedures and is an expert in Dental Bleaching, and is the developer of tooth whitening products throughout the dental industry. He is a member of the American Dental Association, the Academy of General Dentistry, the American Academy of Cosmetic Dentistry and the International Congress of Oral Implantology. Dr. Shatkin is also the President Emeritus of the International Academy of Mini Dental Implants. Be sure to watch Dr. Samuel Shatkin Jr. and Dr. Todd Shatkin as they co-host the biweekly AM Buffalo segment called "Gr8 Look Monday" which airs the first and third monday of each month during the AM Buffalo program on Channel 7 ABC-TV affiliate weekdays between 10-11 am. The doctors are the skin care beauty and dental consultants for the Buffalo Jills Cheerleading Squad for the NFL Buffalo Bills football team. Dr. Samuel Shatkin Jr. is certified by the American Board of Plastic Surgery, and performs all aspects of Plastic and Reconstructive Surgery. He has been in private practice in this field since completing his Plastic Surgery Training in 1989. His major concentration is in the areas of Aesthetic Surgery, including, Facial Rejuvenation, Nasal Surgery, Body contouring and Skin Resurfacing. He has been trained in state of the art technologies, including endoscopic facial surgery, ultrasonic liposuction, and Microdermabrasion. He has recently completed advanced training in Intensed Pulsed Light (IPL) Therapies and Botox tm Treatments. Dr. Samuel Shatkin Jr. is on staff at most of the Western New York area hospitals including Kaleida Health System and The Catholic Health System. He is a member of the American Society of Plastic Surgeons, the American Society of Aesthetic Plastic Surgeons, the Lipoplasty Society, the American Medical Society and is currently the President of the Buffalo Plastic Surgery Society. He is also a Clinical Instructor at the State University of New York at Buffalo.